If you ever wanted to learn martial arts, then our best recommendation for you is Muay Thai. That’s right, this is an ancient self-defense skillset that will teach you both how to defend yourself and attack in many different ways. By training Muay Thai, you will learn how to attack in 8 main different ways. This is why this martial art also goes by the name of “the art of the 8 limbs”. So, you can expect to develop devastating speed and power in your hands-strikes, elbow-strikes, knee-strikes, and shin-strikes. In total – 8 different points of attack. But you will also improve the strength of your character as well. Muay Thai is also a sport. This means that you will be able to compete against other people in this sport and test your mettle and skills. Courage is an absolute must when it comes to this. If you are not courageous, then there is no way in the world in which you will be able to compete. This is not a soccer game. This is the fight game. You can get seriously injured in your fights if you’re not skilled enough. And this is why the sport of Muay Thai is definitely not for everyone. You will increase your strength by learning Muay Thai. At every training session, you will have to work hard. And we mean physically. Dealing blows to the mitts and the pads and the bags takes energy and effort. With time, you will realize that you’re increasing your strength, skills, speed, and reflexes for the better. Above all, Muay Thai can be very fun to learn. No two training session are alike. 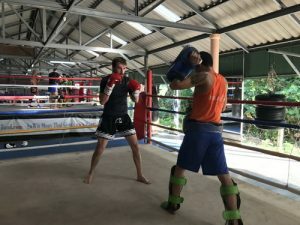 You will find out that there are many likeminded people that train Muay Thai and that you can connect with them. This will make the entire experience a lot more fun than ever before. So, no matter who you are, we believe that Muay Thai can be a phenomenal martial art that we recommend you to learn. Above all – make sure to have fun and enjoy the journey – and you will be on the right track.